Photograph depicts a group on a green at the Capilano Golf Club.Two men and two women gathered on green; one woman is preparing to putt; fairway in background with trees behind. Photograph depicts a fairway at the Capilano Golf and Country Club.Fairway with four sand traps in middle of image; forested area and mountains in background. 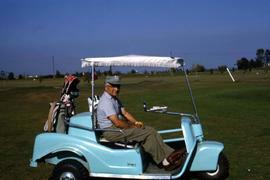 Colour Kodachrome 35mm slide depicts Dr. Irving Snider facing the camera while sitting in a light blue golf cart with golf clubs on the back of the cart. 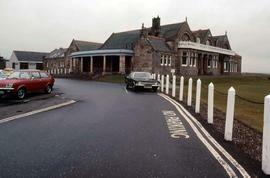 Colour Kodachrome 35mm slide depicts the driveway of an unidentified golf course. Colour Kodachrome 35mm slide depicts five unknown men playing golf. Colour Kodachrome II 35mm slide depicts what looks like four teepees on a golf course with two golfers in the background. Colour Kodachrome 35mm slide depicts four unknown men posing behind a bench and the bench has a sign on it that reads: No. 11, 360 yards, Par 4".